Zimbabwe captain Benjani Mwaruwari has retired from international football following the Warriors' 0-0 draw at home to Cape Verde on Sunday. "I have made up my mind and believe new players have to come and play their part," he told the Herald newspaper. 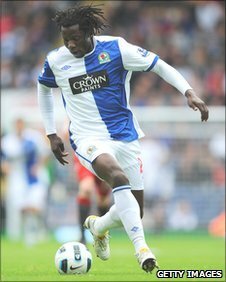 The 32-year-old, who signed a one-year deal with Blackburn Rovers in August, wants to focus on his club career. "I still have a few more years playing club football, and feel I have done my part for my country," Mwaruwari added. "This is the right time." The former Manchester City striker had been Warriors captain since 2006, a period in which the team has fared poorly in qualifiers for both the Africa Cup of Nations and the World Cup. Despite being Zimbabwe's highest-profile player, Mwaruwari struggled to gain the approval of fans, many of whom felt that he rarely reproduced the form that he showed in European club football. "It's sad that things didn't work out the way we wanted and probably I didn't get the number of goals that the supporters wanted me to score," he said. "When you get to my age, there are options that come to mind because it's hard to balance the challenges of international football and club football." Injury ruled Mwaruwari out of Zimbabwe's maiden appearance at the Nations Cup finals in 2004, but he scored for the Warriors in a 2-1 defeat of Ghana at the 2006 edition. He replaced Peter Ndlovu as captain after the 2006 tournament. Zimbabwe's draw against Cape Verde has left them third in Group A of qualifying for the 2012 finals, with two points from two games.